A beautiful selection of paper covered wire flower stamens. Available in various sizes and colours; select from a matte or glossy finish. Bend each stamen in the middle to create 2x stamen ends ready to be attached to your hand made silk or satin ribbon flowers. Double head Holly Berry; may also be used as flower stamens for the centre of your ribbon or stumpwo..
Pearl Bead Spray with three stems per spray in white only. The first image shows three sprays; the s..
Fine stamens available in a matte finish for the centre of your ribbon or stumpwork flowers. 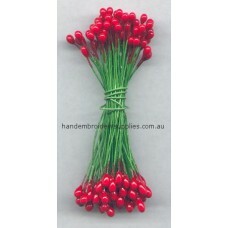 10x sta..
Fine Pearl stamens for the centre of your ribbon or stumpwork flowers. 10x stamens per packet. Pleas..
Large pearl stamens for the centre of your ribbon or stumpwork flowers. 10x stamens per packet. Plea..
Split Head stamens available in a white matte finish for the centre of your ribbon or stumpwork flow..